Disney’s Hollywood Studios is about to be overtaken by Wookiees, droids, Ewoks, bounty hunters and Jedi, not to mention, a few thousand Star Wars fans! Star Wars Weekends returns to the Walt Disney World Resort in just one month. Every Friday, Saturday and Sunday from May 18 to June 10, 2012, Disney’s Hollywood Studios becomes Stars Wars Central as fans gather to celebrate the Star Wars film saga and the animated television series Star Wars: The Clone Wars with celebrity meet-and-greets, autograph sessions, special shows, parades, presentations and more. Hosts James Arnold Taylor (voice of Obi-Wan Kenobi) and Ashley Eckstein (voice of Ahsoka Tano), both from Star Wars: The Clone Wars, will welcome several celebrities from Star Wars: Episode I The Phantom Menace, including Ray Park (Darth Maul), who is scheduled to appear in both Weekends I and II and will meet up with Donald Duck/Darth Maul during an extended engagement. Bounty hunters will take center stage during weekend IV with their very own weekend this year. As an added surprise, both Jeremy Bulloch and Daniel Logan, who portrayed laconic enforcer Boba Fett in the saga, will appear during the event’s closing weekend. The centerpiece of the celebration is, of course, the spectacular 3-D attraction, “Star Tours – The Adventures Continue.” This attraction opened last spring to rave reviews – mine included! “Jedi Training Academy” is very popular, allowing young guests to learn from a Jedi Master before testing their newly acquired skills in a battle with Darth Vader. Be sure to sign up early if this is a must do for your young Jedi. Ending each Star Wars Weekends day is the ever-popular “Hyperspace Hoopla,” a show filled with comedy, dancing, high-energy music and many of the famed Star Wars characters. 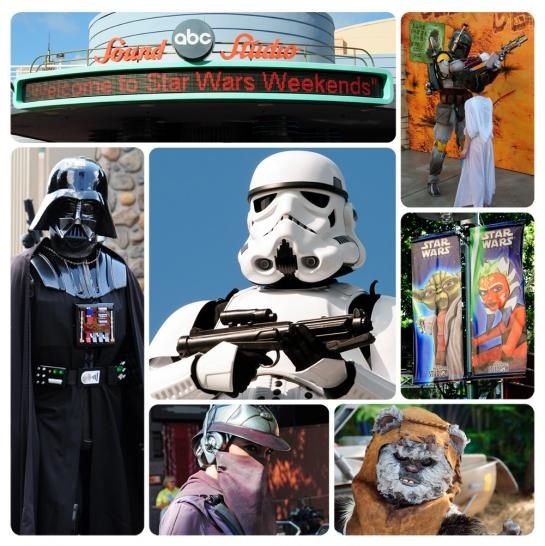 I’ll be catching Day 1 of Star Wars Weekends this year – maybe I’ll see you there. May the force be with us!